The Keizer City Council unanimously approved the formation of a long range planning task force to examine management issues surrounding Keizer Little League Park. The decision was made at the council meeting Aug. 20. The role of the task force is to gather information on the history of the park and what’s been done to date, gain an understanding of the business of running the facility, and assemble representatives of current youth sports participants and the community to help determine how the park will be managed in the future. The city owns Keizer Little League Park, but management and coordination of field usage and concessions is contracted out. Both of Keizer’s youth baseball/softball organizations have held the contract at some point, but both have run afoul of the agreements in the contract in recent years. The eight-person task force that includes Mayor Cathy Clark, City Councilor Marlene Parsons, city council candidate Dan Kohler, James Hutches representing the Keizer Chamber of Commerce and two representatives each from Keizer Little League (KLL) and McNary Youth Baseball, the organization formerly known as Keizer Youth Sports Association (KYSA). “Ultimately, the objective is framework for how the volunteer organizations that run and use the park can best be supported by the city and community for long term success. Success, in my mind, is the park is safe, consistently maintained, improved through a planned projects, and a welcoming place for people to play for years to come,” Clark said. Clark did not have a set date when the task force meetings will begin, but it is expected to convene in the near future. Garry Whalen, a member of the Keizer Planning Commission, asked about the quality of the jobs associated with three growth scenarios. All three projected some job growth, but Whalen asked whether it was full-time, benefitted positions or more part-time jobs. Glen Bolen, a consultant with OTAK, Inc., said the market will decide what goes in where, but Keizer could stack the deck in favor of better jobs. “In the city of Redmond, [on city-owned property,] the more family-wage jobs a business offered, the lower the rent or sale price was,” Bolen said. Kathy Lincoln, a member of the Keizer Traffic Safety, Pedestrian and Bikeways (TPB) Committee, asked what the options might be for businesses already planning on leaving River Road North. Lincoln mentioned the announced closing of Keizer Nursery as one candidate. “We could do some small-area design vignettes. We should take a look at that site – at how it could turn out – and that might get the ideas flowing,” Bolen said. Matt Lawyer, a member of the Keizer Planning Commission and Parks Advisory Board, cautioned against overloading the three of the main intersections of River Road at Lockhaven, Chemawa and Mandrin. If people are suddenly priced out of living in that area, Lawyer said, you are going to need to add traffic controls and parking. Bolen responded that transportation modelers would be tasked with calculating traffic impacts once Keizer narrows down the direction it hopes to head. He added that associated problems can even defy expectations and take care of themselves. “Sometimes, as places intensify and become more walkable, the speed slows down,” Bolen said. Another component of more intense development will be a need for greater public transit capacity and scheduling that doesn’t hinder livability, he added. City Councilor Bruce Anderson asked how the city might link properties behind River Road frontages and reduce stress on or eliminate access directly from River Road. Bolen said the opportunities for such linkages would most likely come as property redevelops, but with so many small parcels and different owners it could take a while. Mike DeBlasi, a member of the TPB Committee and former member of the Planning Commission, asked about the possibilities for different parking types, like roof-level parking or parking decks. Bolen said that the cost to create a parking spot on the ground is about $3,000 per space, but the cost skyrockets once it moves upward – to about $25,000 per space. “Tuck-under parking is another option that is somewhere between the two,” Bolen said. When the question regarding affordable living spaces arose, Mayor Cathy Clark rose to the defense of a manufactured home park on the corner of River Road and Lockhaven Drive. Clark said that space remained some of the most affordable in Keizer and needed to be preserved. When Clark asked Bolen what Keizerites should be thinking about when planning for the next generation of residents, Bolen said public spaces would be key. “Public spaces and parks were identified as goals, but there are opportunities for public spaces. The stream near Waremart should be a place for people to gather. When you intensify development, you need to look at ways to use the public spaces because the demand is higher,” Bolen said. WEST LINN—Playing on the road against maybe the best team in the state, McNary (0-2) showed it could bounce back. The next step is learning how to finish. The Celtics got within one touchdown of West Linn with 8:51 remaining. But the Lions closed the game with 21 straight points to run away with a 55-27 victory. After losing their home opener by 28 points, the Celtics looked like they were in for another long night as West Linn quarterback Ethan Long threw two quick touchdown passes to give the Lions a 13-0 lead with 7:36 remaining in the first quarter. But McNary responded as Erik Barker connected with Noah Bach for a 4-yard touchdown pass to get the Celtics within 13-7 late in the first. McNary again appeared to be out of it as West Linn stretched its lead to 27-7. But Barker found Jacob Jackson for a 13-yard touchdown just before halftime and then connected with Devyn Schurr for a 12-yard score to get the Celtics within 27-21 with 2:57 remaining in the third quarter. After Long threw another touchdown pass, Ryan Bamford converted a fake punt with a 29-yard strike to Schurr. Barker then hit Junior Walling on a wheel route down the McNary sideline for a 13-yard touchdown to get the Celtics within 34-27 with 8:51 to go. But the McNary defense couldn’t stop Long and a fumble on their next possession ended any chance of a Celtic comeback. Long, who has committed to Arizona State, finished the game with 416 yards and six touchdowns. Barker passed for 222 yards, four touchdowns to four different receivers and one interception, trying to make a play with McNary down 48-27 with 2:36 remaining. Walling rushed for 85 yards to lead the Celtics on the ground. McNary plays at Tualatin (2-0) on Friday, Sept. 14 at 7 p.m. The Timberwolves are coming off a 36-28 win over Oregon City. “It will definitely toughen us up these good teams we’re playing,” Auvinen said. Consultants working with Keizer’s city staff on possible growth scenarios fleshed out some of the possibilities during a work session Monday, Aug. 27. Numerous members of the city council, planning commission, parks advisory board and traffic safety committee were in attendance as discussion centered around growth in Keizer’s business corridors, River Road North and Cherry Avenue Northeast. Working off a draft report that included three options – staying the course, implementing efficiency measures and upzoning – Glen Bolen of OTAK, Inc. and Kate Rogers of Angelo Planning Group expanded on the included scenarios and answered questions from attendees. 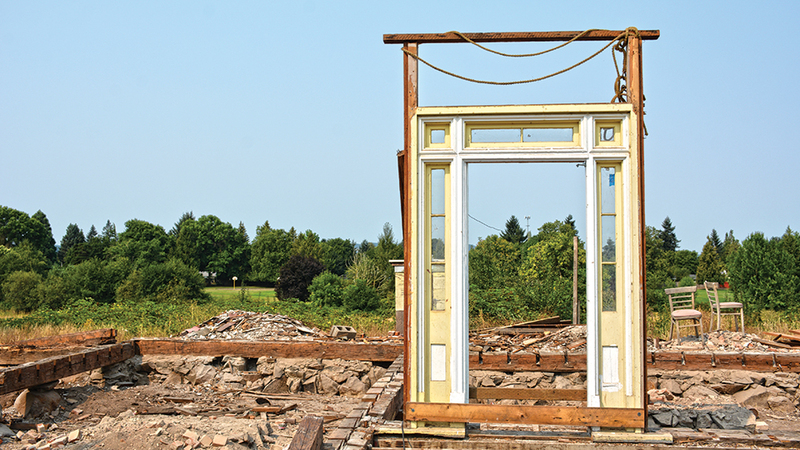 Staying the course means Keizer’s business areas will continue to look much like they have to this point: small-ish wood structures of one or two stories. While the city would not change much aesthetically, staying on that path has other potential consequences, Bolen said. For example, Keizer’s job-to-household ratio of .5-to-1 would not shift much, which has repercussions on how current residents and their families will grow in the future. “We looked at rates for growth in this scenario, and it tracks, but the population is aging and children have gone to other places. 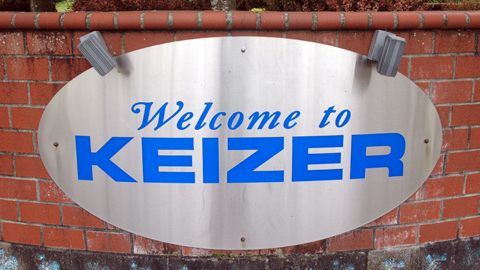 Keizer is not getting the recapture rate of other areas,” Bolen said. Creating more jobs through fostering additional office-type employment and manufacturing would put the city on a path more appealing to young adults that cannot find opportunities locally, he added. Standing in the way that of course is a lack of available land to develop or redevelop. The second option discussed is known as efficiency measures, which would mean changing the requirements on certain types of zoning that currently exist, but not rezoning outright. Potential changes include: increasing density options and reducing the minimum lot size, parking, landscaping, and lot coverage requirements. The third option, upzoning, would mean changing some existing zones outright. Bolen showed one example in the area between Shady Lane Northeast and Candlewood Drive Northeast on Cherry Avenue, the space is currently zoned for industrial uses, but a mixed use designation could add more residential capacity and possibly revive the space with entertainment and shopping options. “Trading off might mean something you don’t want to see, but right now the option isn’t even on the table,” Bolen said. Aside from market headwinds like rental rates and existing regulatory constraints, Rogers said there are geographic elements inhibiting growth. “The proximity to residential areas creates a greater need for buffering,” she said. Coaxing specific types of growth would require implementing some tools that Keizer has only begun dabbling in. “Parking behind or beside buildings, ground floor windows and architectural detailing are the types of tools that create the spaces people want to be. It requires buildings to be oriented to the street and entrances oriented to the sidewalk with allowances for plazas and gathering places,” she said. Tim Coburn had been asleep at the Keizer Fire Department for about an hour when he heard a knock on the door just after midnight on Saturday, Aug. 18. More than 200 miles away, a 9,000-acre wildfire was burning outside of Condon. Governor Kate Brown had declared the fire a conflagration, allowing the fire marshal to mobilize resources from around the state. Coburn, one of 10 firemen on a Marion County Task Force, was one of those resources. He and fellow Keizer fireman Sean Cummings had to be in Woodburn by 2:30 a.m. to meet with firemen from Marion County, Jefferson, Stayton, and Sublimity. They were to be in Condon by 6. By Monday, the Stubblefield Fire had burned more than 30,000 acres and continued to grow to more than 56,000 acres. Between Aug. 18 and 24, the Marion County Task Force worked 12-hour day shifts, 7 a.m. to 7 p.m. Working alongside the Bureau of Land Management and state fire marshall, Coburn and Cummings in their Keizer brush truck put out fires, trimmed Juniper trees and helped local farmers with bulldozing. Coburn and Cummings also went to Lonerock, protecting a ranchers’s home in case the fire spread. The Stubblefield Fire was the third conflagration Keizer firefighters reported to this summer. 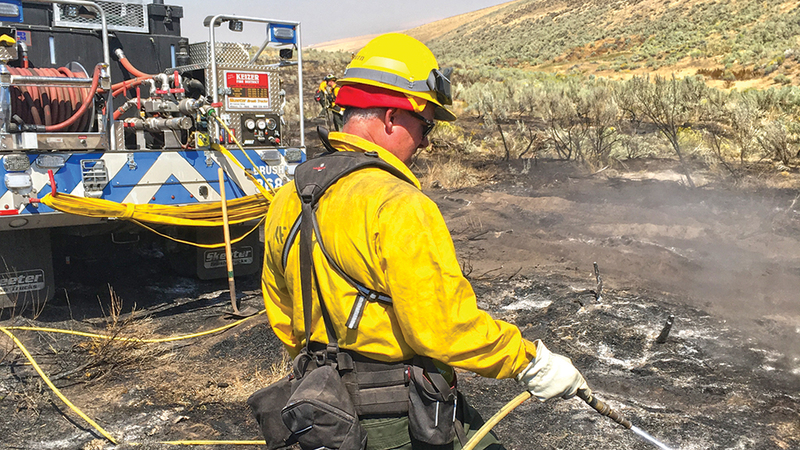 Danny South and Aaron Rowland spent July 18-21 at the Substation Fire near The Dalles. Aaron Pittis, Ryan Russell, Jacob Brinlee and Tyler Bullock then reported to Northern California Aug. 1-3 for the Mendocino Complex Fire. Keizer has 18 firemen on its conflagration list. The Stubblefield Fire was Coburn’s second wildfire after reporting to the Eagle Creek Fire last summer. The City of Keizer will issue letters of support for two projects to improve pedestrian access around Kennedy and Cummings elementary schools. 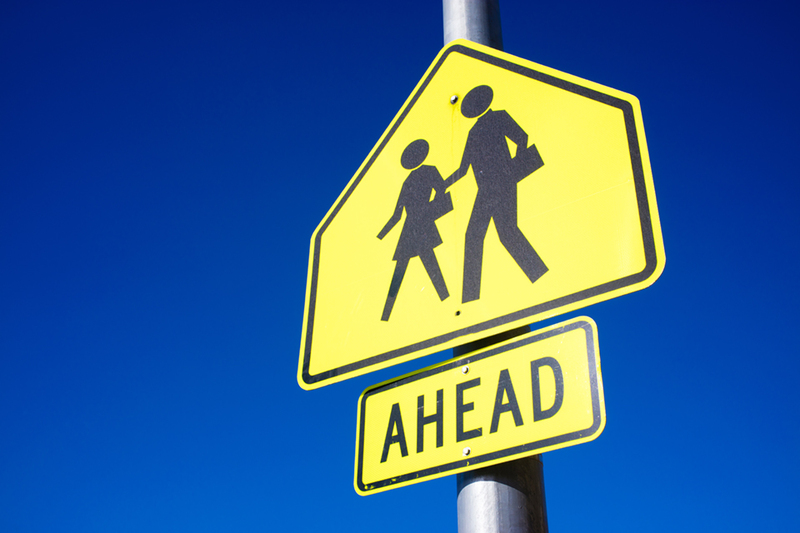 The letters will be submitted along with projects proposals to the Safe Routes for Schools National Partnership. The council approved the request from the Keizer Traffic Safety, Pedestrian and Bikeways (TPB) Committee at its Aug. 20 meeting. Members of the TPB Committee have haggled over whether to support one project over another for months and ended up throwing its weight behind both. Rough outlines of the projects include additional sidewalk and bike lanes as well as additional infrastructure. At the TPB committee’s most recent meeting, Aug. 17, issues of money dominated discussion. Requirements for Safe Routes funding include a 20 percent match on the part of the city. In regard to Cummings, the city might be able to negotiate using an investment being made in by the Salem-Keizer School District – to install sidewalks on the school campus – as matching funds. Around Kennedy, which is the larger of the two projects, the city would likely need to come up with the matching money on its own. Committee Member David Dempster was a proponent of having a back-up plan. Dempster also advocated appealing for monetary support from the city when the 2019-2020 budgeting cycle begins next spring. I thought week one would be difficult for the Salem-Keizer football teams but the road was even tougher than I expected. Area squads went 1-5 and were outscored 210 to 97. Can they rebound in week two? The Saxons were the only Salem-Keizer squad to win their season opener, defeating Newberg 21-14. And their week two opponent is coming off a 24-point loss. But Sunset played one of the best teams in the state in Tigard and allowed two touchdowns on interception returns. After last week, I need to see more from the Salem-Keizer schools in general before I pick one to win in Portland. Speaking of Salem teams playing in Portland, the Titans went to Lake Oswego last week in a game billed as a battle of two of the top teams in the state and were never really competitive, trailing 41-7 at halftime. Lake Oswego’s new quarterback threw for 298 yards and five touchdowns. West Salem’s secondary will obviously have to improve if the Titans are going to make a playoff run. West Salem is the first Salem-Keizer team to play one of the three Bend schools new to the Mountain Valley conference, although in a non-league game. Bend is coming off an impressive win over Barlow in its 6A opener but I expect an angry Titans squad to begin to turn things around at home. The Vikings found out playing in 5A, especially in Special District 3, may not be much easier than 6A, getting shut out at Crescent Valley 34-0 in week one. Now, North Salem hosts Corvallis, who also had a difficult time last Friday, falling 49-25 to Lebanon. The Vikings should be more competitive but can they get their first win? The Royal Scots also struggled offensively last Friday, getting shut out at home 24-0 against West Albany. McKay gets Central next. The Panthers are also coming off a bad loss, getting blown out at Silverton 51-14. I see points being a premium in this one. Picking a winner was more difficult. I don’t know what to think of the Pacers. Last season, Lakeridge won a league game for the first time in four years, playing in the brutally tough Three Rivers League, and qualified for the state playoffs for the first time since 2014. The Pacers then opened this season with a 50-point road win at Jefferson, Portland. All signs point towards Lakeridge being a program on the rise, the Olympians opened the season losing at home and I started these predictions saying I needed to see more from the Salem-Keizer schools before I picked one to win in Portland. Would I back off of that statement jut four predictions later? Maybe. Looking at the Celtics schedule at the beginning of the season, North Medford was supposed to be one of the easier games, which probably says more about McNary’s loaded schedule than it does about the Black Tornado. After losing 55-27 at home, the Celtics now travel to play one of their toughest games against one of the best teams in the state, coming off an overtime win at Central Catholic, another elite program. 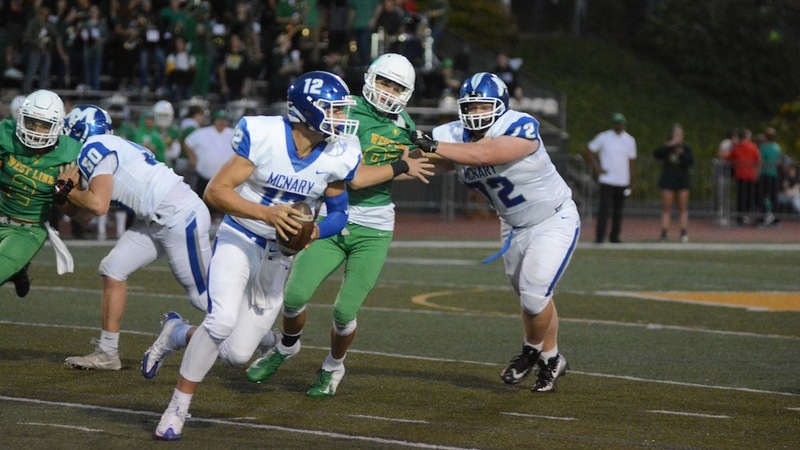 McNary will have to improve drastically in all three phases of the game to have any chance of avenging last season’s playoff loss at West Linn. Derek Wiley is associate editor of the Keizertimes. Izzy Haselip is not just the only member of the McNary girls soccer team to have played Summit. She’s also one of the few girls in the entire state who can say she has defeated the girls soccer giant, winner of five of the last six 5A state championships. The last time Summit lost a playoff game, Haselip was there, celebrating with her Silverton teammates a 4-3 upset in the 2016 semifinals. Haselip scored the second goal of the game. 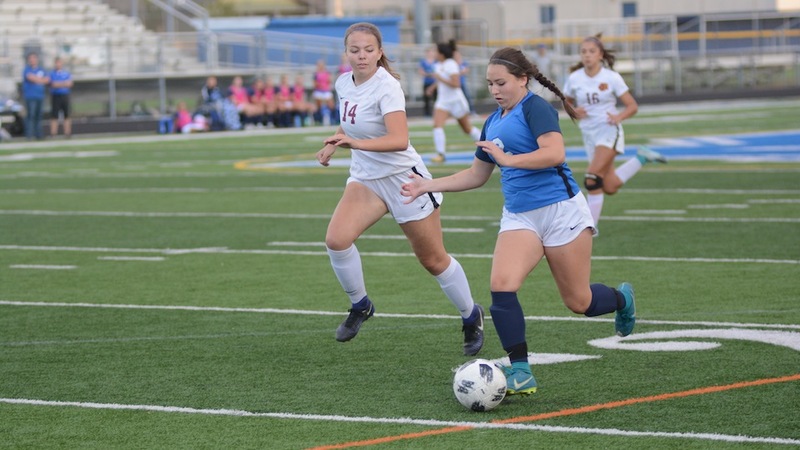 After her sophomore season, which ended with a 3-2 loss to La Salle Prep in the 5A state championship game, Haselip decided she needed a change and transferred to McNary. Nash expected Haselip to lead McNary’s offense last season. “In the initial trainings last year, we knew that she was a forward that could change the way our offense operates,” Nash said. However, a sprained ankle suffered during practice changed the course of her junior season. Haselip missed four league games and finished the year with only three goals. Back healthy, Haselip showed what she’s capable of in McNary’s first game of the 2018 season. Trailing 1-0 in the second half at South Medford, Haselip tied the game with a header and then snuck behind the Panthers defense to score the game-winning goal. Haselip believes McNary can make a playoff run this season, similar to Silverton’s in 2016. As for Summit, who McNary hosts on Saturday, Sept. 29 at noon. “I’ve talked to (my teammates) about how big they are and how aggressive they are and how dominant they are when they have the ball and how well they are shooting from the outside,” Haselip said. “It’s going to be a different game.